Election Tracker LIVE: Congress general secretary Priyanka Gandhi has described the party's promise of a minimum income guarantee 'Nyay' scheme to the poor as the "biggest assault on poverty". Congress president Rahul Gandhi has today announced the income guarantee scheme which will ensure India’s 20 per cent poorest families get Rs 72,000 per annum, if the party is voted to power. The announcement has triggered a political slugfest, with the BJP saying the plan was not fiscally responsible. Congress has said that it has consulted several economists, and it was "doable". 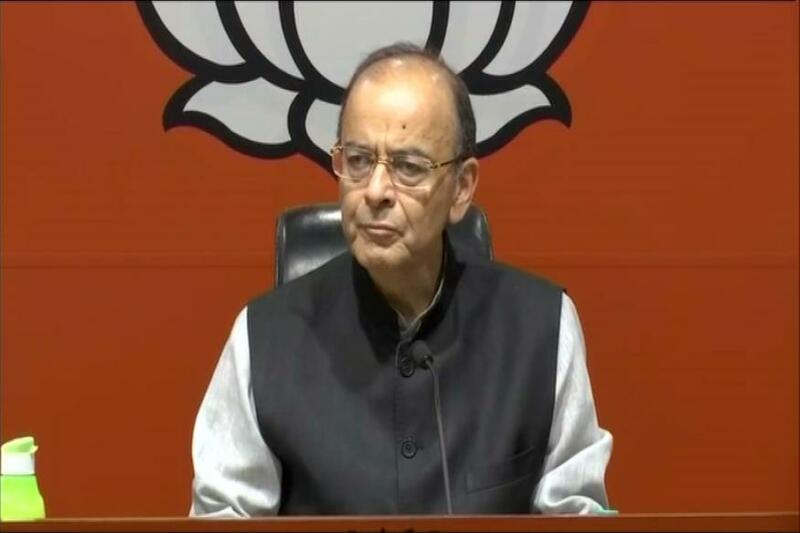 Finance minister Arun Jaitley has hit out at the Congress for its scheme and said the Narendra Modi government is already giving the poor what Rahul Gandhi has promised. National Leaders to Visit Andhra Pradesh for Campaign | National leaders like Kejriwal, Mamata Benerjee, Farooq Abdullah, Tejaswi Yadav, Dewe Gowda, Yaswanth Sinha and Arun Showry are expected in Andhra Pradesh for poll campaign. - While Farooq Abdullah will be visiting Vijayawada tonight itself and will be participating in Kadapa and Allagadda Constituencies for Campaigning. - Mamata Benerjee in Vizag on March 31. - Dewe Gowda a d Sharat Pawar in Anantapur and Kurnool Districts. After filing her papers, DMK leader M Kanimozhi, who will lock horns with BJP's Tamilisai Soundararajan in Thoothukudi, said "Thoothukudi is my choice because I have continuously worked there and know the situation there." DMK leader M Kanimozhi, BJP Tamil Nadu unit chief Tamilisai Soundararajan, Congress' Karti Chidambaram were among prominent personalities who filed their papers on Monday on the penultimate day of filing nominations for the April 18 Lok Sabha elections in the state. Among others to file their nominations were former union minister and DMK leader A Raja, H Raja of the BJP, AIADMK leader M Thambidurai, BJP's C P Radhakrishnan, S Thirunavukkarasar of Congress and E V K S Elangovan (Congress) and VCK chief Thol Thirumavalavan. BJP releases a list of 40 star campaigners for Uttar Pradesh. The list carried names of Prime Minister Narendra Modi, party president Amit Shah, Union Ministers Arun Jaitley, Rajnath Singh, Nitin Gadkari and Sushma Swaraj among others. Nearly 700 Nomination, Including 245 in Nizamabad for LS Polls in Telangana | Nearly 700 nominations have been filed for the April 11 Lok Sabha elections in Telangana with Nizambad constituency alone accounting for around one-third of them as the process for filing of papers came to a close Monday. Over 200 tumeric and 'jowar' (sorghum) farmers in Nizamabad filed the nominations in the constituency protesting the "failure" of the Centre and the state government to ensure remunerative prices for their produce. Ruling TRS nominee and Chief Minister K Chandrasekhar Rao's daughter K Kavitha is among the contestants in the constituency. P Praveen Kumar, one of the farmers who filed his paper Monday, said around 230 ryots have entered the fray. State Chief Electoral Officer Rajat Kumar said as per initial figures, a total of 699 nominations, including 245 in Nizambad, had been filed for the 17 constituencies in the state as of Monday evening. Congress party releases a list of 5 candidates in Chhattisgarh, Goa and Daman & Diu for the upcoming Lok Sabha elections. Congress general secretary for UP-East Priyanka Gandhi tweeted on the minimum income guarantee scheme announced today by Rahul Gandhi to the country’s poorest families if it is voted back to power. Congress leader Ranjitsinh Naik-Nimbalkar joins BJP | Congress leader Ranjitsinh Naik-Nimbalkar Monday joined the BJP ahead of the next month's Lok Sabha polls in Maharashtra, becoming the latest opposition figure to enter the saffron fold. Naik-Nimbalkar, the Congress's Satara district president, joined the BJP in the presence of Maharashtra Chief Minister Devendra Fadnavis, state Revenue Minister Chandrakant. “We will work together as a team,” Sanjay Nirupam says after congratulating Milind Deora for becoming the new president of Mumbai Regional Congress Committee (MRCC). RJD Appoints New Jharkhand Party President, Expels Excumbent for 6 Years| RJD appointed Goutam Sagar Rana its new Jharkhand unit president hours after the incumbent, Annapurna Devi joined BJP in Delhi on Monday just weeks ahead the Lok Sabha polls. Annapurna Devi, who had replaced Rana as the RJD state president in 2018, has been expelled from the party for six years, said RJD Jharkhand unit general secretary Sanjay Singh Yadav. Lalu Prasad (RJD president) has appointed Goutam Sagar Rana as RJDs Jharkhand unit president, a RJD statement said here. She joined BJP along with former RJD MLA Janardhan Paswan in the presence of BJP president Amit Shah, Jharkhand Chief Minister Raghubar Das and BJP MP Bhupendra Yadav in the national capital. AIUDF-Cong in shadow alliance, alleges BJP | AIUDF has decided to field only 3 candidates for coming general elections, leading to speculations on their shadow alliance with Congress. However, AIUDF Chief Badruddin Ajmal has denied any understanding with Congress and said it is to stop BJP from taking the advantage of division of secular votes. Ajmal will seek re-election from Dhubri, also AIUDF’s sitting MP, Radheshyam Biswas will seek reelection from Karimganj. For Barpeta seat AIUDF has dropped sitting MP Sirajudin Ajmal and given ticket to Hafiz Rafiqul Islam. Both Cong and AIUDF maintain they have reached no understanding. Former Assam CM Tarun Gogoi said that AIUDF deciding to contest in only 3 seats reflects they have become weak and their vote base has eroded. DMK nominee K Venkatesan and AINRC candidate P Nedunchezhian filed nominations for the April 18 by-election to the Thattanchavady assembly seat. DMK is heading the "Secular progressive alliance" in which the ruling Congress, the VCK and the Left parties are the other partners. The by-election has become necessary following the disqualification of the sitting legislator Ashok Anand (AINRC) after he was aconvicted by a CBI court in October last in the disproportionate assets case. Grateful to Sonia Gandhi ji and @RahulGandhi for giving me the opportunity to lead @INCMumbai. I commit myself to strengthening the party's roots in the city where it was born. After being appointed as Mumbai Congress Committee Chief, Milind Deora says, "I thank Congress Shri President Rahul Gandhi and UPA Chairperson Smt Sonia Gandhi for trusting me to lead Mumbai Regional Congress Committee. This appointment comes at a challenging time and I commit myself to strengthen the roots of the party in Mumbai. I appeal to all leaders and workers to work unitedly defending and furthering party ideals. The city of Mumbai needs politics of inclusive development. In my view, Indian National Congress is the only political outfit that truly represents the spirit and nature of the city of Mumbai. In my tenure I will focus on holistic development, with a focus on housing for all, protection to small and medium enterprises and enriching social and communal harmony. I also take this opportunity to thank my predecessor Shri Sanjay Nirupam. I wish him great success in his personal and political life." Many congratulations @milinddeora , with you as the Mumbai President I am extremely confident the party will emerge stronger! I Look forward to working with you to achieve the same. 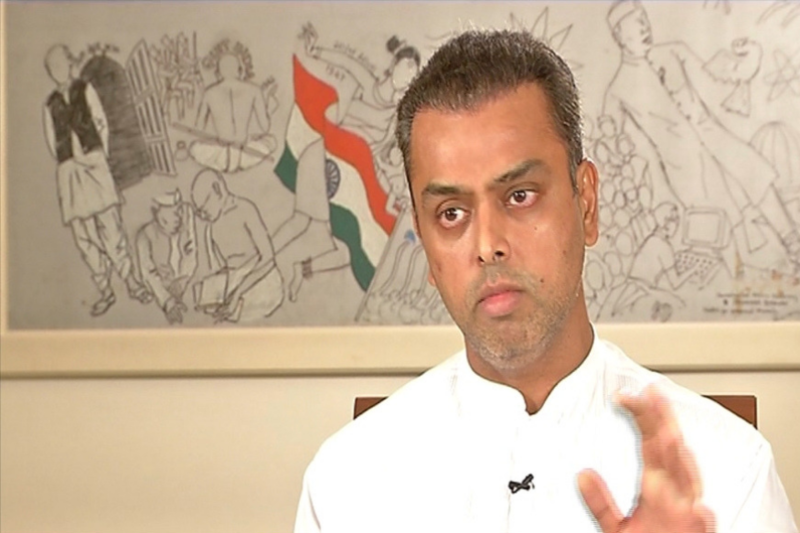 Milind Deora Replaces Sanjay Nirupam as Mumbai Congress Committee Chief | Congress appoints Milind Deora as the new president of Mumbai Regional Congress Committee. He would be replacing Sanjay Nirupam. The Congress today released the 10th list of 26 candidates for the Lok Sabha elections. The party will be fielding Sanjay Nirupam from Mumbai North-West constituency. Nearly a month ago, Deora had clashed with Nirupam for the position of party president in the state but had lost out. After which he had declared that he may not contest the upcoming Lok Sabha elections. 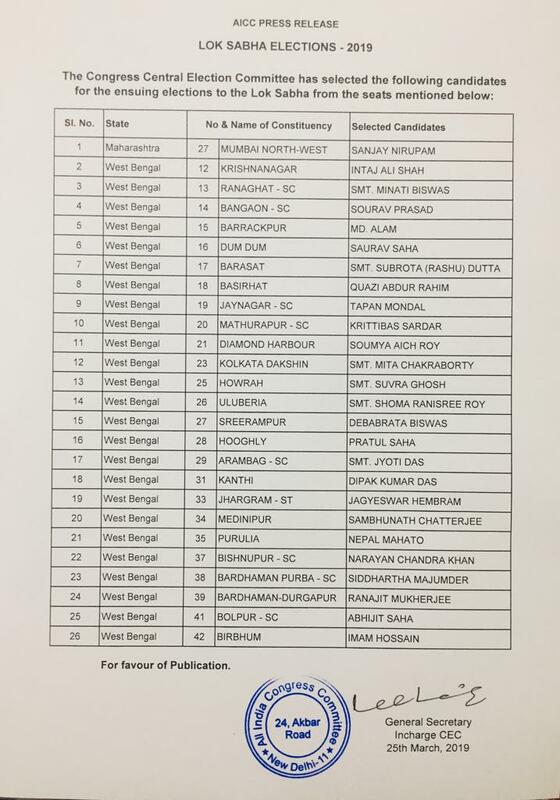 Congress releases 10th list of 26 candidates in West Bengal and Maharashtra Lok Sabha elections. Sanjay Nirupam will contest from Mumbai North-West. Nehruvian model stagnated growth: Jaitley | “Nehruvian model stagnated growth. Indira Gandhi gave legendary slogan of ‘Garibi Hatao’ in 1971 & just redistributed poverty. The legacy of poverty in India reflects inefficient governance & economic model of the Congress Party,” Jaitley wrote in his blog. Visuals of External Affairs Minister Sushma Swaraj and Union Minister Nitin Gadkari from outside the BJP headquarters. The leaders had arrived for the party's CEC meeting. Rahul Considering Second Seat Reflects Cong’s Strength in UP: SP | The Samajwadi Party Monday said reports suggesting that Congress president Rahul Gandhi might contest from another seat besides Amethi reflect the "real picture" of that party's strength in Uttar Pradesh. The SP with its limited strength in West Bengal will extend its support to Mamata Banerjee-led Trinamool Congress in its fight to politically wipe out the Bharatiya Janata Party (BJP) in the state, SP vice-president Kiranmoy Nanda said. Uttar Pradesh Chief Minister Yogi Adityanath will begin campaigning in Azamgarh and Gorakhpur from Tuesday. Adityanath will address a public meeting in Gorakhpur, whereas Deputy Chief Minister Keshav Prasad Maurya will speak at a rally in Azamgarh on Tuesday, said Bharatiya Janata Party zonal vice-president Satyendra Sinha. The chief minister will address the people at the 'numaish' ground in Gorakhpur, in which a large number of people are expected to participate, Sinha said. Kuppalji Devadoss an independent candidate filed his nomination for Chennai South parliamentary constituency by paying his election security deposit in coins. SKM Chief DIsqualified Upon Conviction, Cannot Contest Until 2024: HSP | The Hamro Sikkim Party has accused the Sikkim Krantikari Morcha of electoral malpractice after it declared its president PS Golay as a chief ministerial candidate, with the HSP claiming he stands disqualified upon conviction for corruption. HSP spokesperson Biraj Adhikari alleged Sunday that Golay was convicted and sentenced to 12 months in prison by a sessions court in Sikkim and hence he stands disqualified from contesting elections until 2024. Golay was convicted for corrupt practices when he was the minister for animal husbandry from 1996, Adhikari said. The Sikkim High Court upheld the verdict of the sessions court and dismissed his appeal in June 2017, Adhikari said. Consequently, Golay spent 12 months behind bars and his sentence ended on August 10, 2018, he said. Rahul Gandhi, Sonia Among Star Campaigners in Telangana | Congress chief Rahul Gandhi, UPA chairperson Sonia Gandhi,former Prime Minister Manmohan Singh, former cricketers Navjot Singh Sidhu and Mohd Azharuddin, actors Kushboo and Nagma will be among 40 star campaigners for the April 11 Lok Sabha polls in Telangana. 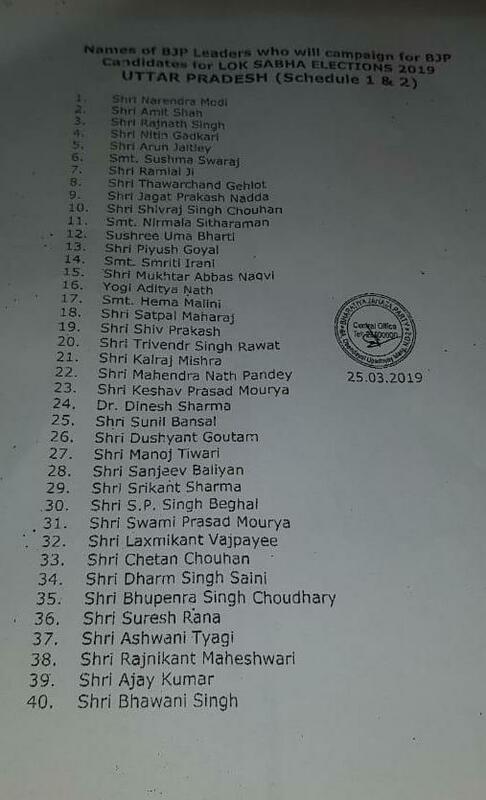 The leaders's names figured in the list of 40 star campaigners released by the Congress. Congress Lok Sabha leader Mallikarjun Kharge, Puducherry Chief Minister V Narayanasamy and Congress leaders from various states, including G Parameshwara, D K Shivkumar, Ashok Chavan will canvass for party candidates. “The latest announcement of the Congress Party if tested on simple arithmetic then Rs 72,000 is less than 2/3rd of the existing DBT under Modi government, which averages Rs 1.068 lakh annually. So what is being claimed by the Congress Party - a bluff announcement,” he tweeted. Congress leader Milind Murli Deora, meanwhile, has replaced Sanjay Nirupam as the head of the party’s Mumbai unit with just weeks to go for the Lok Sabha election. Party spokesperson confirmed the rejig in a tweet. “With you as the Mumbai President, I am extremely confident the party will emerge stronger! I Look forward to working with you to achieve the same (sic),” she tweeted. The Congress fielded Nirupam from the North West Mumbai as it released its tenth list, clearing 26 names for the Lok Sabha elections. Out of the 26 candidates announced by the party on Monday, 25 were for West Bengal. Mohammad Alam from Barrackpore, Mita Chakraborty from Kolkata Dakshin, Suvra Ghosh from Howrah, and Pratul Saha from Hooghly were among those named in the list. With this, the party has announced a total of 253 candidates so far. The Samajwadi Party on Monday, meanwhile, said reports suggesting that Congress president Rahul Gandhi might contest from another seat besides Amethi reflect the "real picture" of that party's strength in Uttar Pradesh. There has been speculation that Gandhi may also contest from Wayanad in Kerala. "We have heard that Congress president, apart from his seat of Amethi in UP would also contest election in other states such as Karnataka or Kerala. This shows the real picture of Congress's organisational strength in Uttar Pradesh," SP vice-president Kiranmoy Nanda said. "We have left two seats for Congress in Uttar Pradesh and three seats for Rashtriya Lok Dal (of Chaudhary Ajit Singh). But the Congress has decided to fight in 73 seats of the state. We would like them to put up a good fight," he said. Defending the decision to leave only two seats for the Congress in UP in the ensuing Lok Sabha elections, Nanda said in the 2017 state assembly polls, his party had forged an alliance with the Congress but it had failed to make any impact. Meanwhile, Makkal Needhi Maiam founder Kamal Haasan met West Bengal CM Mamata Banerjee in Kolkata today. "Our relationship with the honourable CM is quite old and I am coming to take my best wishes from her like last time," Haasan told reporters following his arrival in the city. Haasan had earlier said that his meeting with the Trinamool Congress chief will be of a "political nature", but remained cryptic about what will be discussed. The meeting is slated to take place later in the State Secretariat building- Nabanna. Meanwhile, Congress president Rahul Gandhi today announced the NYAY scheme, promising Rs 72,000 every year to 20 per cent of the poorest families if voted to power. “Five crore families and 25 crore people will directly benefit from this scheme. All calculations have been done. There is no such scheme anywhere else in the world,” Gandhi said in a press conference after the party’s working committee meeting.